These are all common requests of parents with transitioning toddlers and growing school-aged children. You want them to have a fun but also inspiring place to sleep. Here are a few furniture and decor ideas for creating a fun kid’s bedroom. If you’re looking for a bedroom that your “rough and tumble” child will absolutely love, then this fun-time tent bed for kids is it. It’s a colorful coaster bunk bed with a slide, a tent and plenty of places to hide. It would be the perfect addition to a child’s “dream room.” Imagine sliding down the slide in the morning and having meals in the tent. 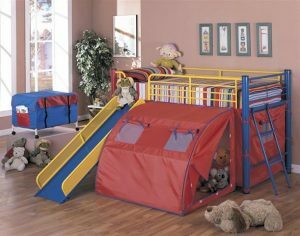 Any child would look forward to bed time if this was in their room! You also save space, because the play area and bed are combined. Here’s a second, more conservative option if you like the idea of a tent-slide bed for your child’s room, but want it to look modern. Most young children prefer to sleep with a night light on. Upgrade your child’s bedroom and give him or her some extra comfort with this cute night light lamp that’s also a wallpaper sticker. 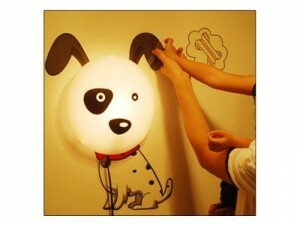 The lamp is shaped like a doggie’s head, so when he lights up at night your child can see a friendly face shining on the wall. The cord that goes into the outlet looks like the dog’s leash! Do you remember those long nights as a child spent staring up at the ceiling, thinking and trying not to fall asleep? 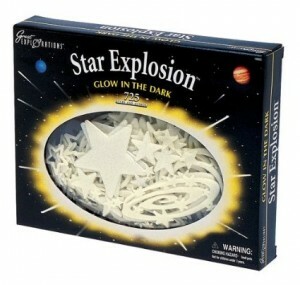 When your child is in bed at night and looks up at the ceiling, let him or her see “the stars.” Add these glow in the dark star stickers to the ceiling to help inspire your child and ensure that he or she has sweet dreams. Have fun creating a fun and inspiring kids bedroom for your child! Did you enjoy reading Create a Fun and Inspiring Kids Bedroom (Under $500)? Well we enjoyed having you and would like to be friends!